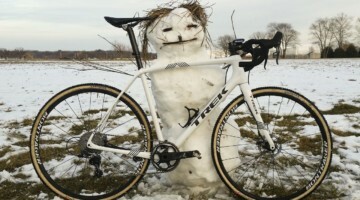 Going into the 2012 cyclocross season, I had exactly zero racing experience and searched high and low for information that might help me to prepare to race ’cross. Road fitness is not ’cross fitness. I can blast out 60-70 miles on the road no problem, but a 40 minute Cat4 cyclocross race left me looking like a fish someone dropped on a dock. 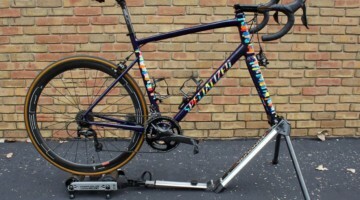 Road fitness is about endurance over time, while ’cross is a short, intense, all-out race where conserving energy is measured in laps, not hours. I’m not saying road fitness doesn’t help, it does, but it’s not the whole story. If you want to retune yourself, look into Tabata intervals (more on that later) and ride practice which focuses on bursts of wattage rather than long sustained pulls. Why ride when you can run? If you don’t attend a cyclocross clinic (and I highly recommend you do. I went to the Blue Steel Cyclery Clinic), you might not have crucial information about when to ride, and when to run. One of the funniest moments of our clinic practice race was watching my friend Nick run by a good 8-10 cyclists on an off-camber uphill twisty section while everyone else tried to get traction on dry, shredded grass. If you’re coming up to an area that might get clogged with racers, get off that bike and run. You’ll be more nimble when there are a glut of new racers trying to navigate a technical section. Look for ‘The Moment” in every race. In every race I was a part of, there was a “moment” when I saw an opening in front of me, even if it was only for a few seconds. When you see that opening, take it. Burn a few matches. Drop a few people. You might get passed later, but especially in lap 1 as people are settling into a certain pace, you will come across chances to move yourself up a few spots and you have to take them. Get out of the saddle and crank if you must, but push yourself up the race as far as possible. By the end of the season, I was able to consistently move up 5-8 spots in the first lap alone by taking advantage of these openings. I got passed later, but that’s due to my lack of race fitness. I can work on that and always bring the ability to pass with me as I get faster. Run-ups are brutal. Run-ups featured heavily in every race I did this year, minus Sucker Brook. As anyone who’s been to Gloucester knows, the run-up there is an absolute monster, and by lap 3, my legs were shot. Shedd Park in Lowell also has an incredible set of runups that slowed me down substantially lap after lap. In fact, most of the spots that I made up (mentioned above) I lost again on the runups there. For me, there were clearly the slowest part of my race and an area that I need to make marked improvement in. Consider the same for yourself and work on shouldering your bike and running up hill with it. If you have a place to practice, get out there and get some reps in to get your legs used to it. If you have shoes with screw-in cleats for the front, I recommend keeping them in as they’ll play a big part in any run-up (especially muddy New England style run-ups). Bike handling becomes very important. Most races I did featured some incredibly tight, technical sections that really start to separate new racers from those with experience. I did find that getting out and riding dirt trails on my cyclocross bike helped with this. I spent a fair amount of time in Haverhill, Massachusetts, riding off-road with my Crux and this will somewhat help you prepare for technical sections. In addition, the previously mentioned Tabata intervals are helpful for these sections. f you practice your ability to briefly sprint out of each corner, you’ll shave seconds each time off your laps. You might out-corner the guy next to you, but coupling that with a brief out-of-corner sprint to move ahead will make a substantial difference over time. Small races = Tougher fields. This is just a theory, but I felt like the smaller the race, the tougher the field was. Most Cat 4 cyclocross racers are not going to get up early and drive 60 miles to a freezing cold ’cross race in the middle of New Hampshire unless they have a stake in the race. The NE Velocross race that I did was one of the smallest fields, and I got completely left in the dust by guys out there gunning for points to make it to Cat 3. On the flipside, some of my higher placings were in big races like Gloucester where other newbies are getting their start. Cyclocross is a game of seconds. 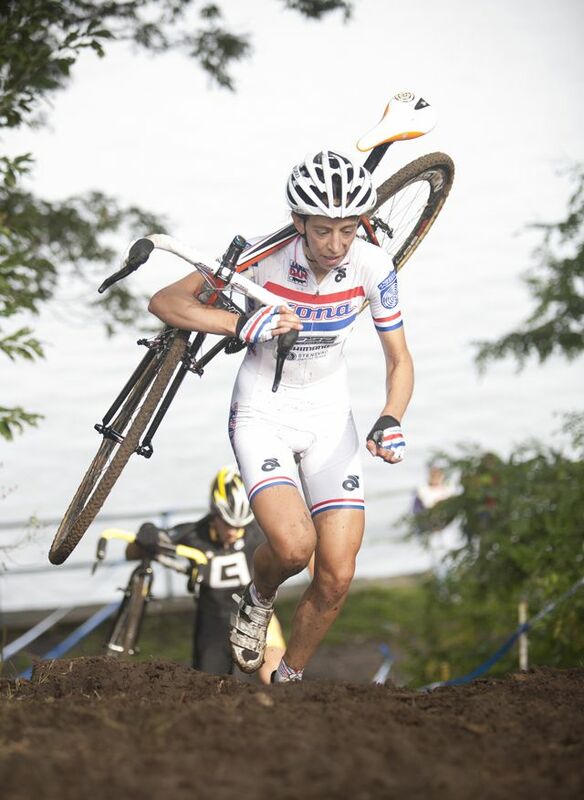 Just like the adage that football is a game of inches, cyclocross is a race of seconds. For neophyte racers, there are so many new things to learn, and there’s probably not one big tip that is going to make a dramatic difference. Instead, focus on incremental gains by improving run-ups, working on bike handling, knowing when to dismount, and increasing your ability to put out short bursts of power. No one of those tips will make you the fastest, but combined together you’re going to slice time off each lap. Looking back at my results, I never did that great (usually in the last 25% of each race) but looking at the race times for each racer tells a different story. Five racers might only be separated by a minute, so saving each one of those seconds brings you closer to moving up a spot. Most of all, have fun. Be okay with coming in last (I did! ), take each race as a learning experience, and ask yourself afterwards what you learned. The only way to get better is to keep doing it. 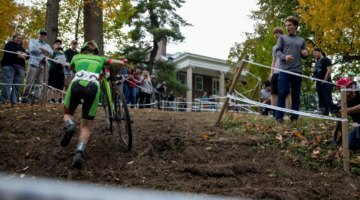 I hope this helps anyone looking to get into cyclocross, and feel free to email me or comment below if you have thoughts you want to share. Seth Lincoln is a west coast transplant living in New England, where he discovered cyclocross and took up cross racing in 2012. He started Not Quite Belgian with cycling buddy Nick DiGangi to cover their favorite topics: Cross, road riding, beer, and gear. NotQuiteBelgian dave_us absolutely dude! Really great reads. Nailed it! Dig your blog! Bikes/Beer/Gear… never a bad combo. Thanks for a well written piece. My first year too. Bullet #1 was a wake-up call. I can ride all day but 45 minutes of CX can trash my legs. My biggest learning has been that, yes, the tire setup is really important. I now have tubulars and the difference is beyond simple description. Can’t wait for next year. @talcx That’s how I felt after switching to tubulars for the road, but I can’t bring myself to bash up carbon wheels during ‘cross season. I know there are a few less-costly options for tubular rims out there, I guess I’ll see how things look come tax-return time. Thanks again…I didn’t get to mess around with tires this past year other than dropping my pressure substantially for the muddy races. Oddly enough, I was impressed by the durability of clinchers during racing. I thought for sure I’d pinch flatted a few times on some of the rougher bumps but I made it through the season without any flats. On the other hand, maybe I’m not racing hard enough? I talked to a couple experienced racers about dropping the pressure on my clinchers. One pointed out that clincher tires aren’t designed to run at low pressures so that even if you don’t pinch flat your tire isn’t performing very well. These guys said get a relatively inexpensive set of tubular wheels (see the Williams review) and tubular tires. They told me I’d be amazed and, I was. Maybe you can find a CX friend that will let you try their wheels. One lap and you’ll be a convert. 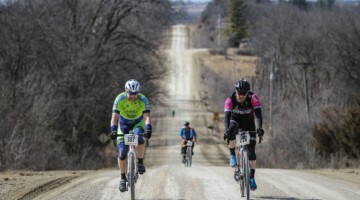 You got it right about deep grass – the Sucker Brook race is early in the season so it’s on a mix of dry grass, deep grass, and torn up dry dirt – I rode my regular tires in that race and you feel the burn really fast churning through the deep stuff. I may try a file tread early on for the 2013 season and see how it performs in the drier races. Me too. I’m going to run a Ritchey Speedmax Cross Comp 40 in the back and a Kenda Small Block 35 in the front. Nobody has tire calipers for the Cat 4 races! @jmccachren @NotQuiteBelgian I’m sure I’ll give non-carbon tubies a shot at some point, I just need to place a little higher in the field before I can justify it. I will be racing file tread tires for early-season (non-muddy) races which should help a bit.